Thomas R. Ittelson, is a scientist, businessman, author, and teacher with many years of hands-on experience in business development and marking for technical companies. As a consultant to entrepreneurs, Ittelson has written business plans and prepared financial projections that have helped raise more than $500 million in start-up equity capital. 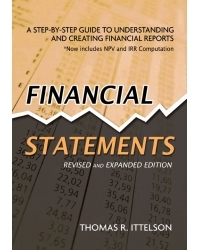 Financial Statements was born from the author’s efforts to teach client entrepreneurs how to design and use financial statements in their start-up businesses.